When I try to associate Codea to my Dropbox account, I enter my email and pwd, then it loops undefinitely. Does somebody knows where this could come from ? Are you using the link from the Codea home page, the gear icon top right of the page, and then the Dropbox link about halfway down the right side of the screen. @Leon_levy sorry about the errors you are experiencing. I'm re-writing the Dropbox component right now and will hopefully have it ready for the next update soon. Basically the Dropbox v1 API that Codea was using is being discontinued. And we are migrating to the v2 API. It is supposed to continue to work for a few more months though, so I'll look into it. @Simeon @Leon_levy I'm currently not having any trouble syncing files between Dropbox and the Codea Dropbox folder. Maybe the only trouble is in the initial link and the v1 API transfer is still working for now. @Simeon Since Apple won't let you do imports, maybe something that can be done is an import from the Codea Dropbox folder. Put whatever you want into the Dropbox app folder and sync it with the Codea Dropbox folder. Once it's in the Codea Dropbox folder, do the import from there. If it's a zip file, do the unzip first. Right now when I do the project export to a zip file, I save it in Dropbox which gets synced with Codea. I can then sync them and have a zip copy in the Codea Dropbox folder. 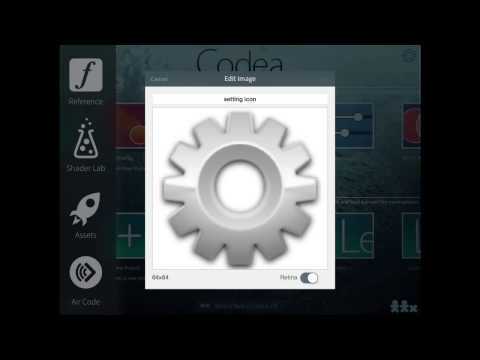 Hello Simeon, I used the link from the Codea home page and the gear icon and then the"Associer" link. I enter my email and pwd then it enters in an infinite loop. I joined a screen hard copy. @Leon_levy I'm currently rewriting Dropbox sync from scratch. Would you be interested in joining the next beta to test this functionality to see if it resolves your issue? @Leon_levy can you send me an email (simeon@twolivesleft.com) or private message with your email address? @spacemonkey I did that for a dictionary file. It put 300,249 words in an image with a size of 1024x1024. I still have the image, but I haven't found the program yet. EDIT: Since then, I wrote a program that backs up all of my 490+ projects into one text file that I store in Dropbox. I use readText to read the file and pull out any project I want. @spacemonkey Here's something I found. @spacemonkey Is that a valid link. I get a blank page. @CamelCoder @Simeon That's strange. When I try that link it takes me to the second page of the discussion, which is blank. If I tap the << to go to the previous page, page1, it does nothing. I stay at page 2. If I sign out of the forum and I'm a "Howdy, Stranger", and I try that link, it takes me to the first page of the discussion which has a lot of comments. If I tap >> to go to the second page, it's blank like I see it when signed in. But I can tap the << which takes me to the first page. So I'm not sure why I have a problem with that discussion when I'm signed in. I linked the dropbox acct to codea, but I dont see any of the files or folders when i press the dropbox icon via the assets icon. I've put a folder in the dropbox acct., that says 'sound waves' which contains sounds of cards shuffling and such, which i think should have come with codea already. Is it possible that i dont see the folder because i havent paid the $15 fee ? @kendog400 - you may already know this but, when you set up a Dropbox acct link in Codea a Codea folder is set up in the Apps folder of your Dropbox account. Files are only visible in that Codea folder if they have a limited selection of file types eg png, jpg, txt, doc and others. So those are the only files you can see. But, you can still access files from folders within the Codea folder by addressing . May have to include filetype if not recognised by Codea/Dropbox. Hope that helps, plenty of examples on the forum. The Codea Assets Dropbox scanner sees all of the PNG files in the "home" directory, but not files in the desired subdirectory. @pgyore I’m not sure what’s happening for you. Just for a test, I loaded a .png image to my Photos Camera Roll from the Internet. From the Dropbox folder in Codea, I loaded the .png image from my Camera Roll into the Codea Dropbox folder. I then syncd my Codea Dropbox folder with the Dropbox app which showed the image in the Dropbox/Apps/Codea folder. I also created a folder Dropbox/Apps/Codea/test1 and copied the .png image there. It showed there OK. I used a small Codea project to display the .png on the screen from the Codea Dropbox folder. So the image showed up in the Dropbox/Apps/Codea folder, in the Dropbox/Apps/Codea/test1 folder, in the Codea Dropbox folder, and on the screen using the sprite command. @pygore when you sync your Dropbox account with Codea it searches the Dropbox:Apps/Codea folder and provides images of all the recognisable files in the Dropbox assets within Codea. It does not show file types it doesn’t recognise or subdirectories within the Dropbox:Apps/Codea folder. However if you can see the files there with Dropbox App or the new Apple File app then you can programmatically load the files from that folder or any sub directory therein, as described by @dave1707 or in my note to @kendog400 above. I dident even know that the folder was in : Dropbox:Apps/Codea. I viewed the youtube video ; Lesson 7 Codea / Patrick Coxall. And it never said anything about this... The video was posted in 2014..
Dave and Bri, thank you. That worked. I was expecting to see the graphic or a thumbnail in the assets dialogue, but it works fine without actually seeing it. Regards. @pygore - if you have iOS 11 on your pad, with the new file app you can browse the files ‘on my Pad’ and the location folders there should show you Codea. Clicking on the folder will give you icons for all the files in the Documents plus folders for assets. One of the is the Dropbox.assetpack and you can see there all the files from Dropbox, it also allows you to look at the contents of each Dropbox sub folder. The Dropbox.assetpack is the same as ‘Dropbox:Apps/codea’. This gives you another way to check out files etc. Note the file app came with iOS 11 - worth upgrading to if you have a compatible system but it also changes a lot about the way you handle files etc. See @dave1707 concerns on the direction of iOS development (another recent thread) - not everyone appreciates it. @kendog400 Dropbox has been accessible for some time through Codea. You may have an issue if you have low memory and a lot of apps. What have you placed in the Dropbox folder - you are better putting files in using the Dropbox app. Also, after adding files to the folder, remember you need to sync the folders through Codea. I've placed sound wave files mostly shuffles for card games, plus a few button tings. I placed them in Apps/Codea..I've looked at the settings in codea and it says account is linked..I have a feeling that I've missed a step or two...Where is the sync button ? I've touched everything, still no dice.. The sync is in the Codea asset/Dropbox folder at the top right. @kendog400 if you can’t see any files when you’ve used the Dropbox sync you may have unrecognised file types. If so try putting a graphic .png file into the folder and resend. @kendog400 See this link. I show a program that downloads an mp3 file to the Documents folder. To dave1707 : Can I change the link ; tune="http://www.magicmusicx.com/uploads/4/2/7/2/4272634/16._lovin_on_dire_docks.mp3",..to i-Cloud to extract the files from there ? @kendog400 - that’s quite a big file just short of 7Meg. I assume you want to stream? Try looking at the following link, it’s old but it may do what you need. Hope that works, never tried it. Bri_G, i tried to change the link to retrive a card shuffle sound, but no luck, i get a file with no sound..
Link didn't work on anchor so copy and paste above. Here I have 3 photos, I have the dropbox acct linked, I still see nothing..
@kendog400 In the Photos album in the Dropbox app is a photo of a parakeet. Copy that into the Apps/Codea folder. Then from the Dropbox folder in Codea do a sync. You should see the png image like I show. The one image shows the Dropbox app and the other the Codea app. This looked like it worked good, But does it handle mp3 files as well ? @kendog400 I had no problem syncing an mp3 file in the Dropbox app with the Dropbox folder in Codea. See the images included.